Vegetarian and Vegan recipes...that meat eaters will appreciate as well! Almond butter is something you used to only be able to find in a health food store...and when I was a child, my Mom would buy it instead of peanut butter. So I would go to school with my almond butter and jelly sandwiches and wonder why Mom couldn't just buy some Skippy! Luckilly my views have changed since then, I now work in a health food store and appriciate things like almond butter. Now that it is more widely available and more creamy (not unstirrable like the natural brands used to be), I actually love the stuff! I usually buy the organic roasted maranatha almond butter...it has wonderful flavor! It is awsome when used in cookies in place of peanut butter for a change, but I love it in savory applications as well. 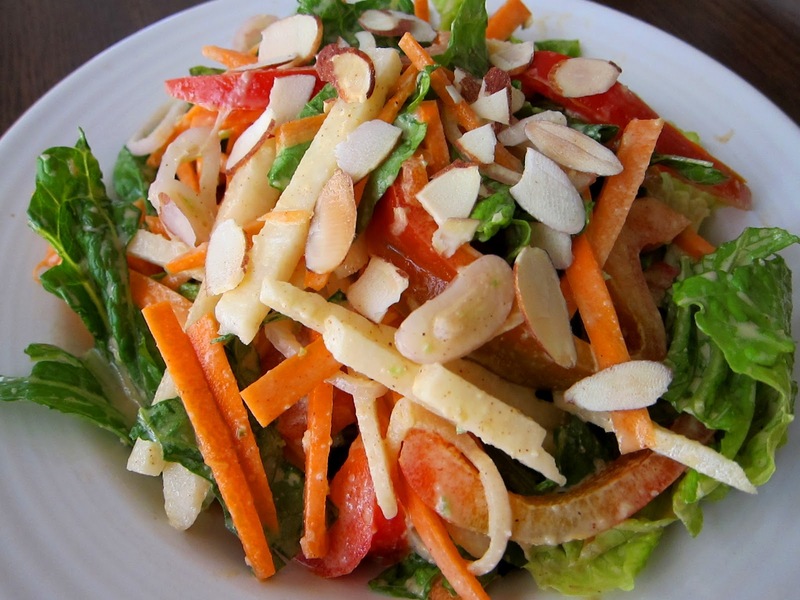 One of my favorite uses for almond butter is dressing for a salad. I like to combine it with some heat, and it works well with the almond flavor. For the heat in this instance I used a jalapeno pepper, dried chipotle and fresh ginger, and I loved the result. If you want it even more spicy you could use a seranno chili, but I wanted it to be a bit more mellow this time. This is a great simple salad recipe, and the dressing makes extra, so you can store the extra in the fridge and use it later. To make dressing, combine all ingredients in a food processor and process until smooth. In a large bowl, combine lettuce, carrots, jicama, bell pepper, and about 1/3 cup of the dressing, or enough dressing to coat (reserving the rest of the dressing for future use). Toss well to coat, and divide among the plates, topping with the toasted almonds. Wow what a great flavor profile. Almond butter, tamari, jalapeno, ginger full-on flavor blast. This looks like an tasty dish. Good job! Cheers! Visit my sweet blog, Fragrant Vanilla Cake! Just click this photo! I am a runner who believes in eating real food that nourishes the body and pleases the eye. I have an artistic mind, and I enjoy creating raw and plant based recipes. Good recipes are meant to be shared...and that is why I started blogging! Asparagus and Ramps...Spring has arrived!